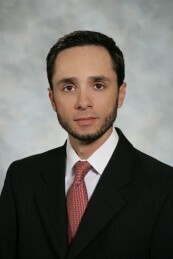 Mr. Guerrero is an attorney in Dean Mead’s Orlando Litigation Department. He focuses his practice in the areas of commercial and real estate litigation. As a litigator, Mr. Guerrero has experience in a variety of commercial matters, including contract and business disputes, commercial landlord/tenant disputes, commercial foreclosures, and enforcement of creditors’ rights under defaulted loan transactions and court judgments. Mr. Guerrero is fluent in Spanish. His professional activities include involvement in the Hispanic Bar Association of Central Florida. Mr. Guerrero is a past president of the organization and now serves on the Board of Directors of its Foundation. Additionally, he is co-chair of the Real Property Committee of the Orange County Bar Association. Mr. Guerrero also is a graduate of Leadership Orlando Class 75 and the Florida Bar Leadership Academy. Mr. Guerrero is a member of the inaugural Board of Directors for the new Hispanic Bar Association of Central Florida Foundation - launched in the Fall of 2017. Their mission is to support local law school students by providing them with financial and professional support to help them achieve their educational and professional goals. The Foundation is a collaborative effort among current and past HBACF members who possess the passion, vision and hard work to invest in the next generation of Hispanic leaders in Central Florida. In addition, Mr. Guerrero has been a strong leader in support of the University of Florida and the Levin College of Law. He spearheaded Dean Mead's participation in the UF Law Firm Giving Program in previous years. The UF Law Firm Giving Program generates support for academic programs, students and faculty, and provides assistance in meeting the financial needs not covered by tuition or state funding. Are Community Association Managers Practicing Law?